The Isabella Stewart Gardner Museum theft played an unexpected role in this past Monday’s episode of The Blacklist – the NBC show starring James Spader as a criminal mastermind who offers to help the FBI catch some of the world’s most nefarious and elusive bad guys (and ladies). Spader’s character, Raymond Reddington, is seen sitting in his lair admiring Rembrandt’s “Storm on the Sea of Galilee,” the artist’s only known seascape, and one of thirteen works of art stolen from the museum in 1990. Coincidentally – or not, depending on what you think the show’s writers were trying to suggest – Reddington, a former government agent, went rogue and disappeared that very same year. Reddington hints at his involvement, commenting to a potential buyer: “The blues. The blues look green and gray. The gaping maw of the ocean – mesmerizing. I don’t know why I’m doing this. 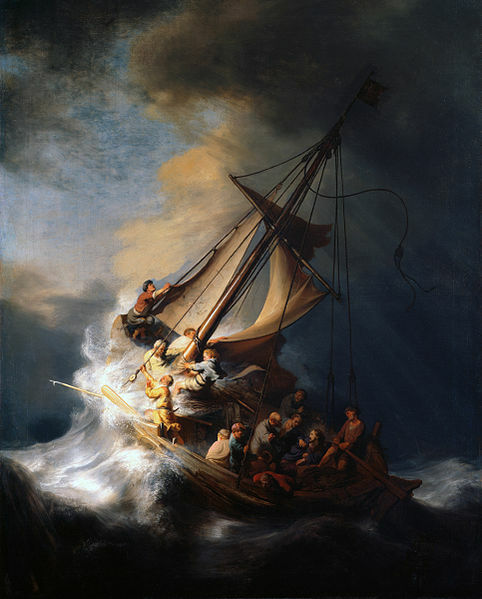 The painting should be hanging in Boston.” It’s just too bad that the FBI agent with whom Reddington works didn’t realize that she was so close to at least partially solving the largest art theft in history and recovering one of the world’s most wanted paintings. Of course, given what we know about how art thefts are committed in reality, it is very unlikely that a slick, wealthy criminal overlord such as Reddington would be responsible for the theft. It is much more likely that common criminals were involved – and not so they could sit and admire the works as Reddington does. However unrealistic the scenario may have been, I, for one, was excited to see the appearance of the painting in the show, and I wonder how many other viewers caught the reference.